We take pride in every aspect of our business, sourcing wood from local saw mills where possible thus ensuring the timber is of the highest quality. The wood we use is pressure treated which has a longer life span than that of untreated timber. We can also offer hand crafted metal gates and railings for that special touch! 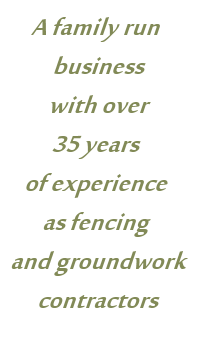 Other materials we use in the construction of our fences come from companies that are of proven quality to ensure we are able to give our customer the best choice and reliability. One of these is GALLAGER electric fences who offer a top quality product that not only are produced to a high standard but if anything goes wrong, they provide replacement parts so there is no need to spend lots of money on a whole new unit!